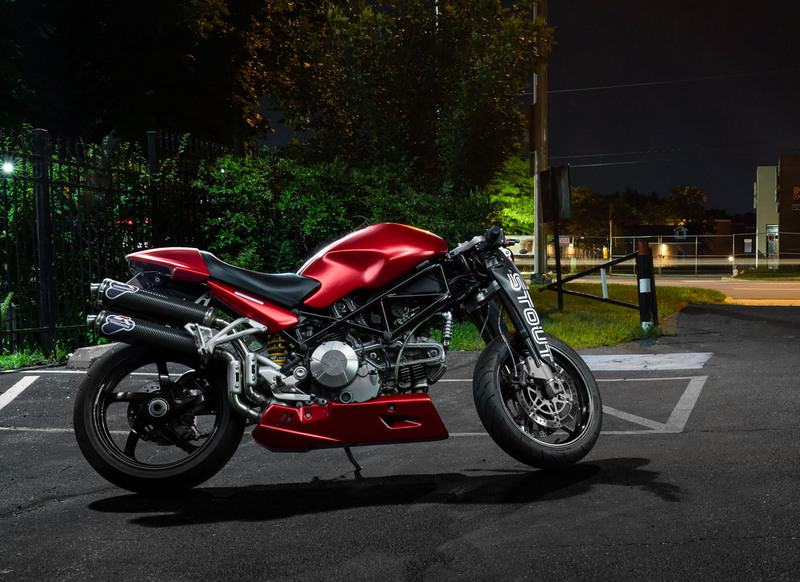 But what really unleashes the classic sound and soul of the Desmo Twin is the fitment of the Dual right sided carbon fibre Termignoni exhaust system. On the other side of the engine the air filter has been replaced with a K&N unit, while the emission gear has been ditched. 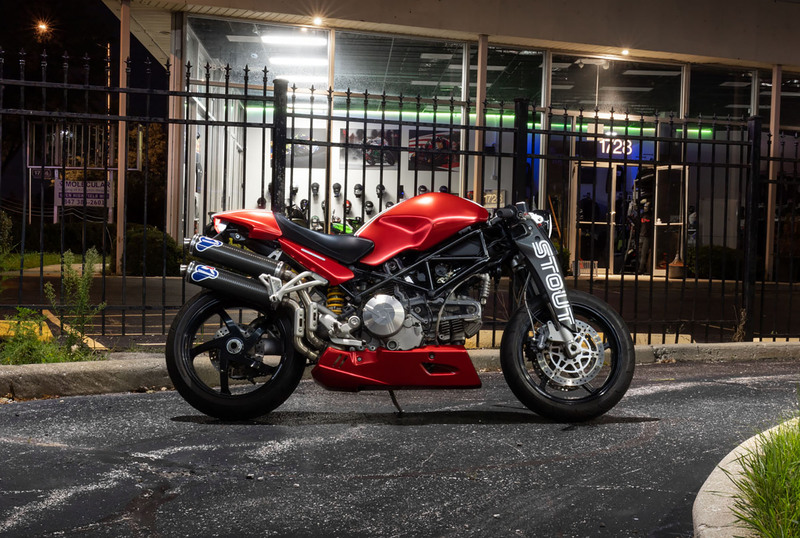 To make the most of the mods the Ducati Performance ECU has a Rexxer reflash and the bike now spits out a dyno proven 83hp at the rear wheel; a solid spike over standard. 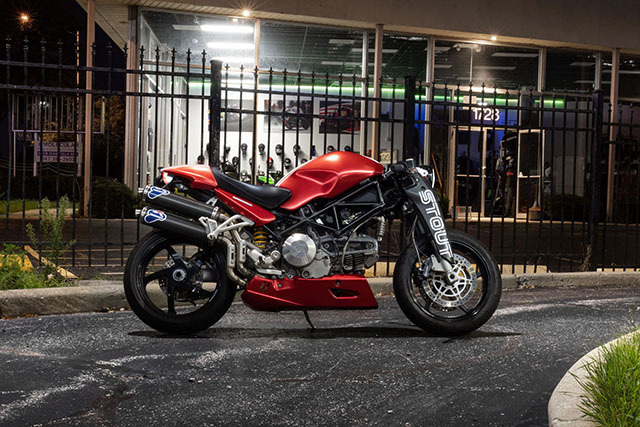 With that sort of fun ready to be unleashed, Chris wanted a bike that caught the eye and it’s impossible to miss those Paolo Tex fork covers that give the Monster a very confederate feel. 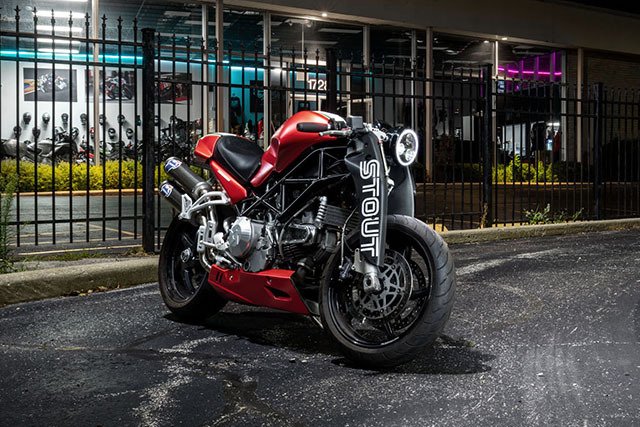 While balancing out the now meaty front end is a belly pan from GSG, that stops the bike looking too top heavy. Out back things get cleaned up with a Zenmoto fender eliminator kit and integrated tail light system. 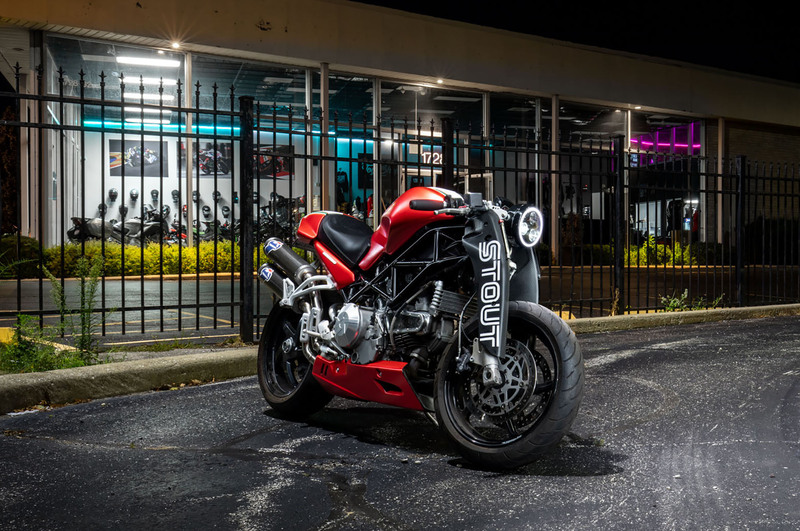 With the S2R being a special piece of Ducati history, the decision was made to wrap the bike and preserve the factory paint. 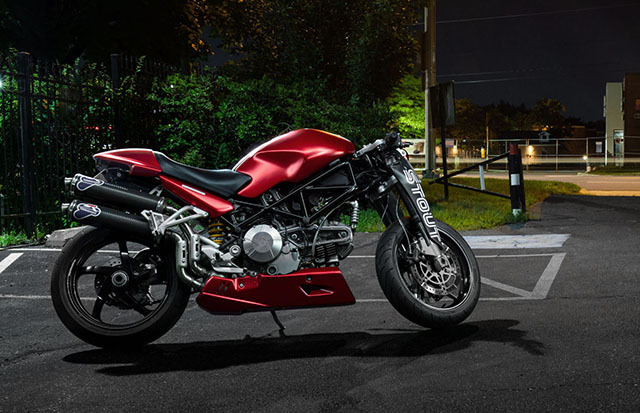 The Satin Red is certainly eye popping and a change from the usual blood hue seen on Ducati’s. 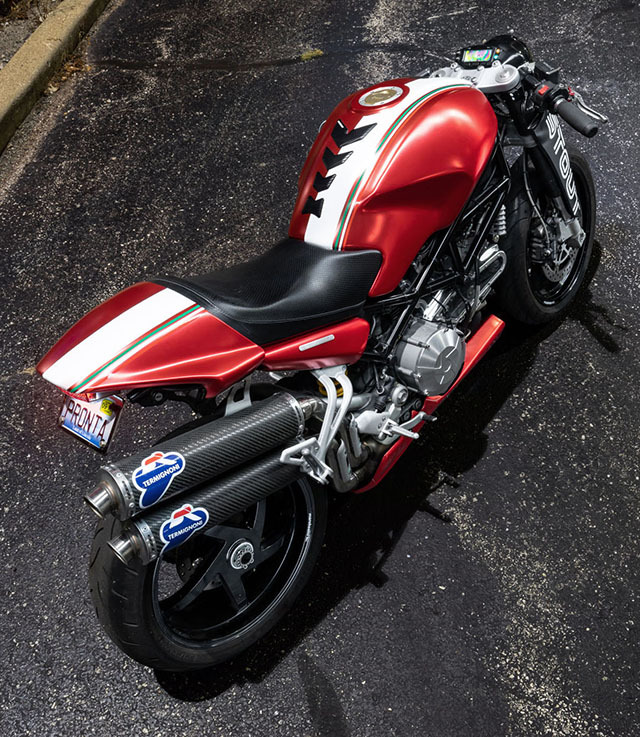 But the Tricolor strips running down the bike are the perfect piece of tradition and matched with the Stout graphics you’d need to be wearing blinkers to miss this Monster motoring by. The handling is already brilliant with fully adjustable kit from the factory, but a change to S4R rear links make height adjustability a breeze. Improving on the stock Brembo brakes isn’t easy but Galfer cross-drilled rotors get that job done. While a set of Marchesini forged alloy rims keep the unsprung weight down and get wrapped in the best rubber. With Vortex racing clip-ons and Gotham cycles footpegs giving a more race ready riding position. There are so many little touches and changes it would be impossible to name them all, but the low mounted Vapor Digital LCD multifunction dash certainly cleans up the front end. While a lightweight Yuasa battery and LED lighting strips further weight off this already light and flickable machine. Chris is eager to thank the Illinois based businesses that made it all happen, The Toy Shop, Miki’s Motorcycles and Midwest Muscle Cars. The idea was never to reinvent the wheel, but like the creation from your local Barista, Double Espresso provides the perfect punch on a Sunday morning.